Let me start by saying, Episode 22 of the TV series REIGN titled “Slaughter of Innocence” was all types of awesome. So awesome I do not even know where to start so let me just give a play by play. Something really unexpected happened in this episode, I was so wowed because I totally did not see it coming, but we will get to that later. Remember in Episode 21 [Watch REIGN – Episode 21 Season 1 – Long Live the King] Catherine and Mary had initially planned to assassinate King Henry, which he got wind of because Mary’s uncle snitched that someone was trying to take his life. Well, this episode starts with King Henry in a room, he had called a meeting of people which included Mary, Catherine, Francis, Nobles and some other citizens. He still keeps seeing the ghost from Episode 21 and while addressing the small crowd, he asks for a confession. A man in the crowd speaks up but says something totally unrelated to the situation and King Henry immediately kills him. It as then and there that Francis realized, his father had to be taken off the thrown somehow. In this episode, Pascal, the little boy that was rescued in the forest is off with Kenna in she and Bash’s new house while Sebastian and Nostradamus are out looking for “The Darkness”. The finally find the place they are looking for and boy was it gory. Stench of dead bodies, bones, writings on the walls. They knew they had found where the darkness does his dirty deeds. While looking around Bash saw a writing on the wall, a pagan poem which he had heard Pascal recite and it immediately clicked to him that Pascal and Kenna could be in danger and immediately hurries out to them. Meanwhile, while Kenna and Pascal were in the house, they heard silence, before you could say boo, here comes the darkness, he comes after Kenna and Pascal and she runs with him into the room and locks the door. He tries to break down the door to get to them and during this confrontation, the door is kicked in. OMG! ok let me just say, my adrenaline was rushing at this point because I thought the darkness was going to kill Kenna, but when the door swings open, it was Bash. Pheww. The Darkness and Bash got into a confrontation and Nostradamus (who just keeps getting hotter by the day lol) stabs the darkness from behind. He falls to the ground, and Bash asks to be left alone with him. Nostradamus takes Kenna and Pascal out of the room. Bash ends up killing the darkness but not before being told by the darkness that, Pascal is his successor and the sacrifices need to continue or else something bad will befall the land. Of course Bash doesn’t believe him so he exposes his face and finishes him off. Now back to the castle, remember crazy King Henry and his obsession for taking over England? Well, since he made up his mind that the only way to do it is by getting married to Mary, he decides he is going to assassinate Francis. Can somebody say KOOKOO? lol. So he plots with on of his men on how Francis will be assassinated and then begins to dote on Mary. He invites her out to an event he organized for her and instead of allowing Catherine sit on her side, he gives Mary Catherine’s seat. 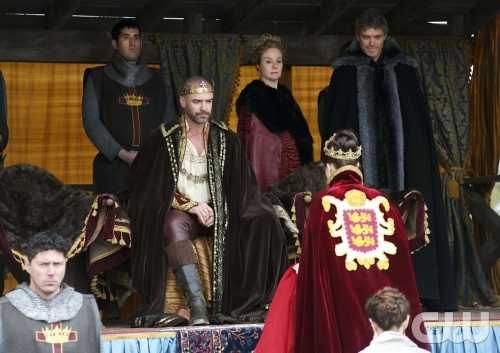 Trust Catherine to start suspecting something, and her suspicions got worse when King Henry tried putting his hands on Mary’s lap. lol. ok let me 1st say I totally love King Henry and that unexpected thing that happens in the show happened to him. I am not sure how I feel about it yet but I digress. At the “show” he organized, King Henry had the fireworks replaced by live ammunition so a lot of soldiers who made it back from the war ended up dying for no reason and this infuriated Francis further proving to him that King Henry could no longer rule France. Oh, do you remember Greer’s Kitchen boyfriend Leith? Well he is no longer a kitchen boy turned soldier. He.He saved Francis’s life during the war and when they made it back, Francis rewarded him with land, money, servants, and he is now pretty much rich. He runs to Greer to give her the good news but she tells him she still cant be with him because she is engaged to Lord Castleroy. She says her fathers debts are bigger than what he has and she can’t afford to take the risk and allow him sell her sisters off to the highest bidder. Meanwhile, while all this is going on, Lola is in labor in some village somewhere and it is looking like she will not make it, so she writes a letter to Mary too come to her aid and just in case she doesn’t make it, to take care of her child as if it were her(Mary) own. Pheww!. Told you this episode was awesome. It was filled with so many highs. So the letter is sent off to Mary and what happens after will make your jaw drop. Oh BTW, when Leith was going to meet Greer, he ran into a pretty young lady who turned out to be someone’s daughter. Ill tell you who at the end. Lets fast forward to the end. King Henry organizes another event, this time it was a Jousting Event. During the beginning of the event, Mary shows up wearing the English Coat of arms, pretty much declaring herself Queen of England. oh oh! Yes we smell trouble and drama following this decision. lol. Of course King Henry is excited about this and decide he want to show off to Mary. He offers to partake in a Joust. He gets on the horse and during the Joust take a big hit. The hit was on purpose and you can’t guess who dealt the blow. Francis!. He is hospitalized and somehow comes back to his senses enough to address some of his demons. He tells Catherine he wants her to make peace with Diane. Catherine inst too happy about this but she obliges. Francis then comes in next to see him and he confesses to Francis that he(King Henry) was the one who killed his elder brother by poisoning him. Remember the Ghost King Henry had been seeing, well that was his dead brother. The ghost stands there, gestures to King Henry and right then and there, it was over for him. Yes, King Henry dies in this episode. WOW! Now that was a huge surprise for me because I never thought they would kill off his character. Francis who is now King by default runs out and is met by Bash who begins to kneel before him but Francis pulls him up into a brotherly embrace. I soo love these two when they are getting along. Oh Bash and Kenna finally declare their love for each other in this episode, so lets hope the whole Bash and Mary story line ends here. Francis goes off to meet Mary and they enter into a deep conversation about being there for each other and not keeping secrets and it was at this point that Mary tells Francis he is about to be a father. She tells him about the letter and tell him he needs to go be by Lola’s side and she will join them. Francis hurries off and while this is happening, it seems what the darkness told Bash is coming to pass because a plague hit the town and Catherine asks that the castle be locked down. Mary runs off to catch Francis before he leaves but he says he is still going to go regardless because “what could be his only child” is out there and he will not let them die out there. OUCH. The episode ends with the castle gate being closed and Francis leaving to find Lola. Oh! remember the girl Leith ran into? She turns out to be Lord Castleroys daughter. I know there is some plot to her being there and I just cant wait to find out what it is. I totally can’t wait for Episode 23. I will be posting this Episode for your viewing pleasure, once it is available online. Dare I say, REIGN totally RULES!! !